The following story was shared by Jose Rojas, PhD, RRT, Department of Respiratory Care, University of Texas Medical Branch. Porcine lungs powered by the ASL 5000 Breathing Simulator at the UTMB used to demonstrate recruitment maneuvers. We have been using the ASL 5000™ Breathing Simulator to teach students aspects of pulmonary physiology as it applies to mechanical ventilation. One approach is to integrate the ASL 5000 with human patient simulators that are connected to mechanical ventilators. This approach allows faculty to recreate actual patient scenarios in a safe environment where students can get hands-on experience with the adjustment of ventilator settings and interpretation of ventilator graphics. The ASL 5000 also allows us to compare the response of different ventilators to similar patient conditions. Students are able to examine features such as tube compensation, flow trigger, and the mixed pressure-volume algorithms. The use of the porcine lung to demonstrate recruitment maneuvers stimulated us to consider the possibility of using the ASL 5000 to investigate ways to improve protocols for the handling of ex-vivo perfused lungs. We believe this would provide interesting research projects for students and faculty. Many of the current ex-vivo perfusion protocols involve using positive pressure and high concentrations of oxygen to maintain isolated perfused lungs. 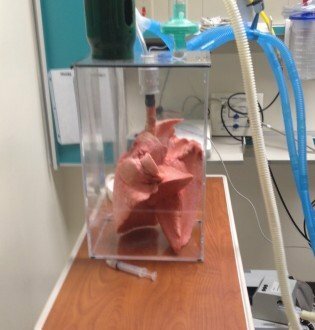 The longest time that perfused lungs have been kept viable ex-vivo is about 10 hours. Using the ASL 5000 to model breathing, we would like to explore the possibility of extending survival time of ex-vivo perfused lungs. We believe that lowering the FiO2 and avoiding positive pressure ventilation could improve viability. Further development of this model could lead to advances in therapeutics related to airway clearance, mechanical ventilation, and airway pharmacology. In the video below, the porcine lungs are attached to an Avea ventilator in the CPAP mode (no pressure support) with 10 cmH20 CPAP. The ASL 5000 is set as a single compartment model that is generating approximately 30 cmH20 pressure and programmed to breathe at a rate of 20 breaths per minute.